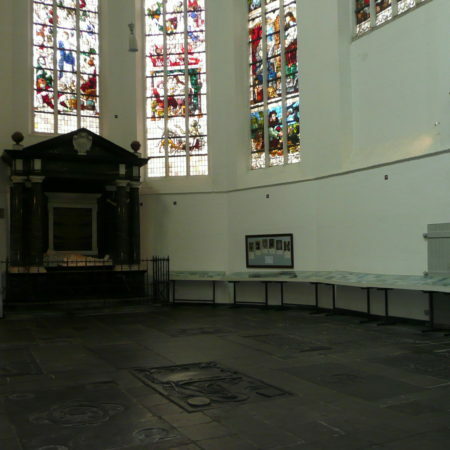 Floor slab of Joost Corneliszoon van Lodensteyn, burgomaster of Delft (d. 31 April 1660), his wife Maria van Voorburch, and their descendants, Oude Kerk (Old Church), Delft (Netherlands), Belgian hardstone, 223 x 136 cm. The monument of this month dates from the Dutch Golden Age – the time of Vermeer and Rembrandt. From a monumental perspective Delft owes its greatest fame to the grand marble tomb of William the Silent (d. 1584), which was created by Hendrick de Keijser in 1614-21 and which is situated in the choir of the Nieuwe Kerk (New Church). Yet Delft has two churches, which were both once paved with tomb slabs of varying sizes and quality: more humble memorials perhaps, but nonetheless interesting. Commemorative stone slabs date from the time when those who could afford it were buried in individual or family graves under the church floor; a practice which started in the medieval period and which was finally abolished in the early nineteenth century. These slabs came in varying sizes, from small headstones on simple graves to huge slabs that covered family vaults. As Holland has no stone quarries that provided suitable material, slabs had to be imported from elsewhere, such as Őland limestone from Sweden, sandstone from Germany (e.g. Bentheim), and various types of blue hardstone from modern-day Belgium. As such each of the stones covering these graves under the church floor represented a sign of wealth and status. 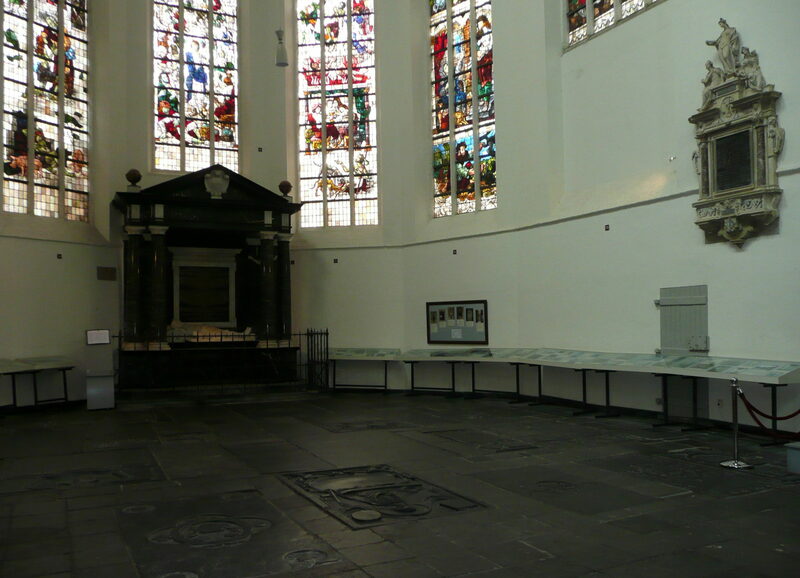 The memorial slab which commemorates burgomaster Joost Corneliszoon van Lodensteyn (also spelled Lodesteyn or Lodenstein), his wife Maria van Voorburch and their descendants is one of the most impressive examples in the Oude Kerk (Old Church) in Delft. Situated in the choir of the church, it is still in a remarkably good condition if one considers the inevitable wear and tear from footsteps over nearly four centuries, but there have been significant losses. The design of the slab is almost theatrical and laden with symbols. Two curtains are lifted to reveal Death personified, his skeletal figure partly covered by a shroud, who directs his empty eye-sockets towards the viewer. 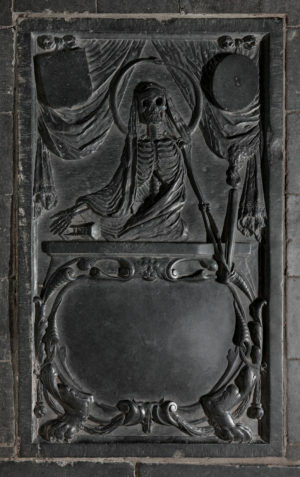 Allegorical representations of Death are frequently found on tomb monuments across Europe in this period. At first sight Death’s head appears to be encircled by a halo, but this turns out to be an ouroboros, a classical symbol that consists of a serpent eating its own tail: it represents cyclicality or eternal return, and thus embodies hope. Death often carries a weapon, such as a spear or a bow and arrow, but that is not the case here. Traditionally he wields a scythe, an attribute that he shares with Chronos or Father Time – the two figures are frequently found side by side – but on this slab the scythe is absent. 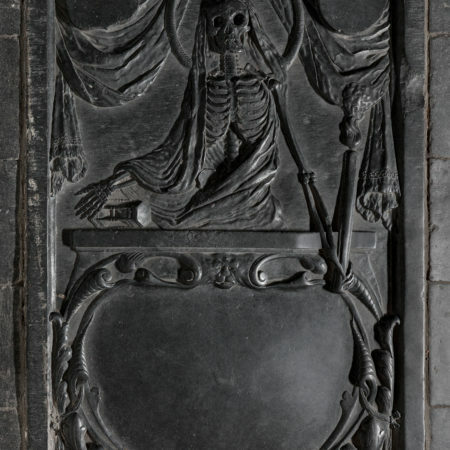 Instead Death’s skeletal right hand rests upon a fallen hourglass, which indicates that time has come to end for the deceased burgomaster and his family. Yet the burning torch that Death holds in his left hand offers hope: torches were traditionally used in funeral processions and an extinguished torch pointing downwards symbolises death, whereas a burning upright torch represents life. De rustplaatse van Joost van Lodenstein Cornelisz. obiit 16 Augustus 1677 oud 57 jaren. obiit 31 Mei 1681 oud 70 jaren. died 16 August 1677, aged 57 years. In the upper corners, suspended from ribbons in front of the curtains, hang two heraldic shields for Joost van Lodenstein and his wife Maria Dirksdochter van Voorburch. It is fortunate that these shields have survived: as emblems of a detestable aristocracy, many heraldic devices on Dutch monuments and floor slabs were hacked away during the French Revolution, or when slabs were sold on for re-use. However, their devices have likewise been worn away, even though they were still recognisable in a photograph published in 1938. Death was an apt emblem for Joost van Lodensteyn, who was born in 1584, the year that saw the assassination of William the Silent in the Prinsenhof in Delft. Van Lodensteyn filled several public offices during his lifetime. He was alderman (schepen) of the city of Delft in 1640, 1641, 1642, 1647 and 1648, and trustee of the city’s orphanage (weesmeester) in 1644, as well as treasurer (thesaurier) in 1650. 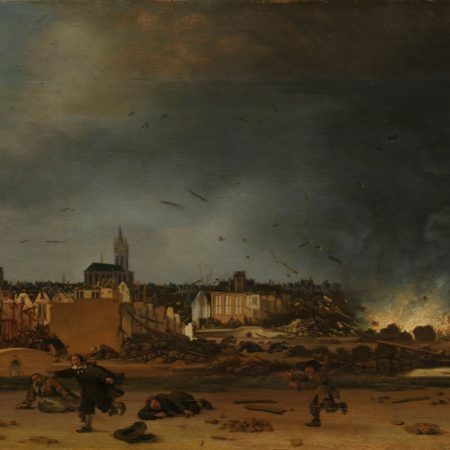 He also served as burgomaster of Delft in 1653 and in 1654, the year when a large part of the city was destroyed and many citizens were killed in an event that became known as the Delft Thunderclap. This disaster happened on 12 October when some 30 tonnes of gunpowder exploded that were stored in the former Clarissen convent. The grave was evidently intended for family burial. Local registers record the deaths of Van Lodensteyn and his widow Maria, their son Jodocus or Joost, Dirk and his widow Amalia. Jodocus’s body was carried into the choir of the church by sixteen bearers. Ownership of the grave can be traced up to 1827. ● Oosterwijk, S., ‘“For no man mai fro dethes stroke fle”. Death and Danse Macabre iconography in memorial art’, Church Monuments, 23 (2008), 62-87, 166-68. 1. Floor slab of Joost van Lodensteyn (d. 1660), his wife Maria van Voorburch, and their descendants, Oude Kerk, Delft (Netherlands). Photo: Chris Booms, Rijksdienst voor het Cultureel Erfgoed (RCE). 2. Interior of the choir of the Oude Kerk, Delft. Photo: Drs Annemarth Sterringa. 3. 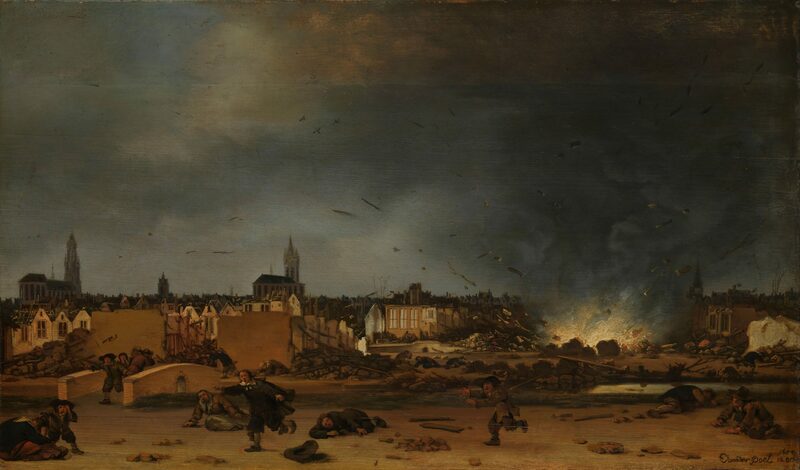 Egbert van der Poel (1621-64), A View of Delft after the Explosion of 1654 (1654), oil on panel, Rijksmuseum: on the left the New Church and the Old Church tower over the ruins of the city.